Another year, another big game to watch! 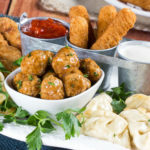 As everyone gears up to cheer on their favorite team, I’m getting ready to binge on some of my favorite game day snacks and appetizers. From the cheesy to the meaty, I’m planning on going all out this year. 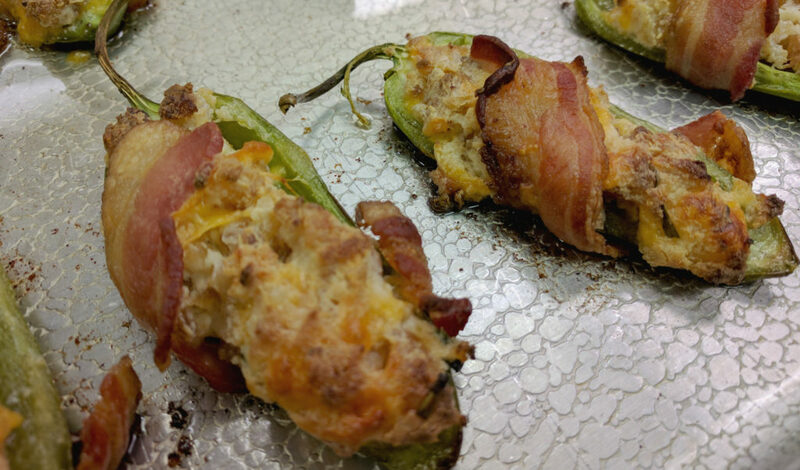 Not only will I be serving those easy quesadillas that I made last year, but I’m also introducing some brand new jalapeno poppers into the mix. 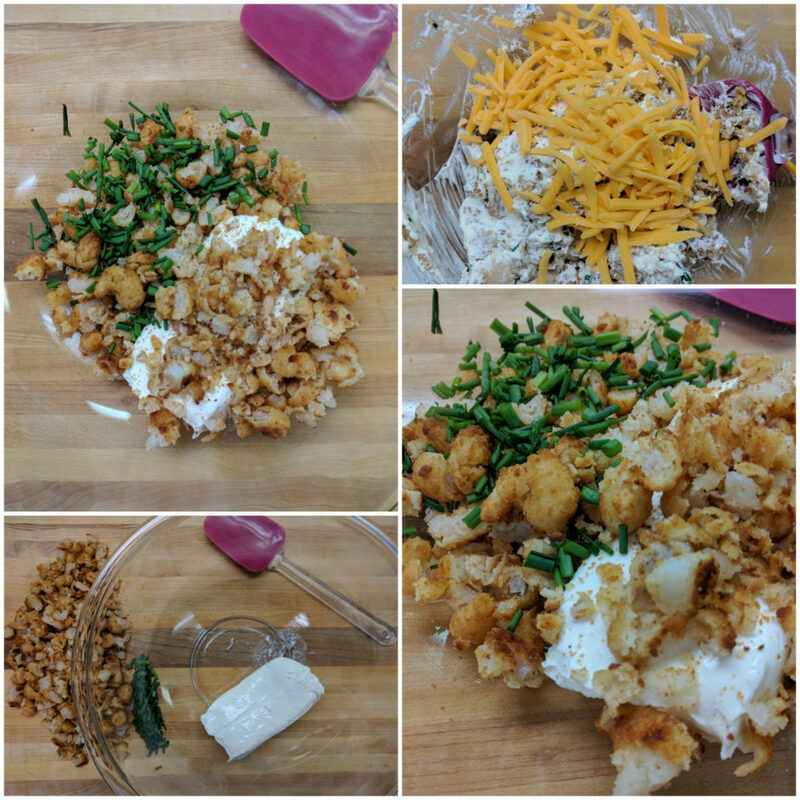 Step One: Get everything you need – popcorn shrimp, cream cheese, cheddar cheese, chives, jalapeno peppers, bacon, and hot sauce, if you want an extra kick. Step Two: Prepare your popcorn shrimp, according to package directions. 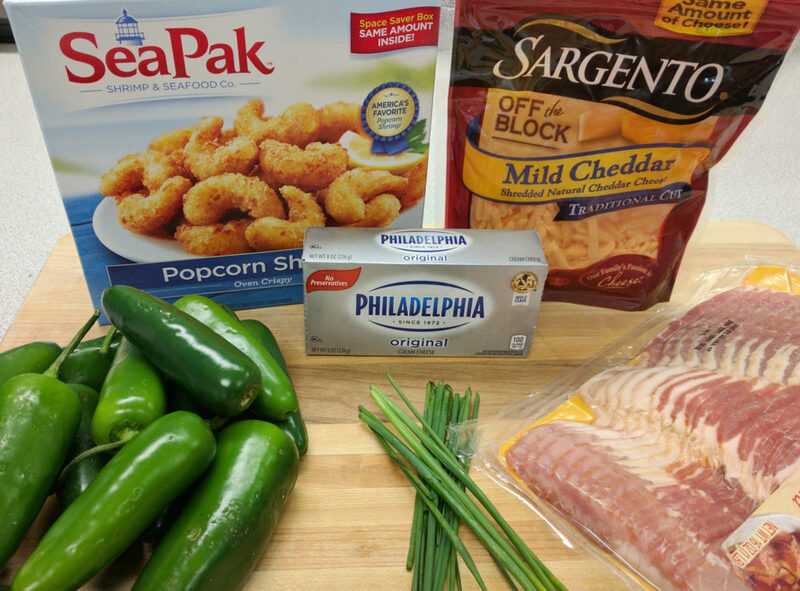 You only need half the box for this recipe, but you can make the whole box and set them out with some dipping sauces for another appetizer option (or just make a double batch of poppers – they’re that good). 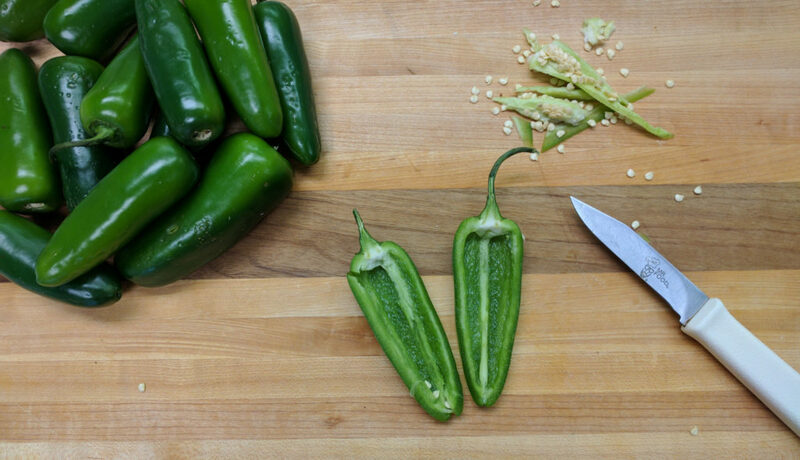 And while those are baking, go ahead and use the time to get your jalapeno peppers cleaned up and ready for stuffing. A word of advice, the Test Kitchen highly recommends using gloves to do this. Touching the peppers with your bare hands can cause some irritation, especially if you have sensitive skin. But, even worse, is forgetting that you handled peppers and then touching your eyes or other body parts…ouch! 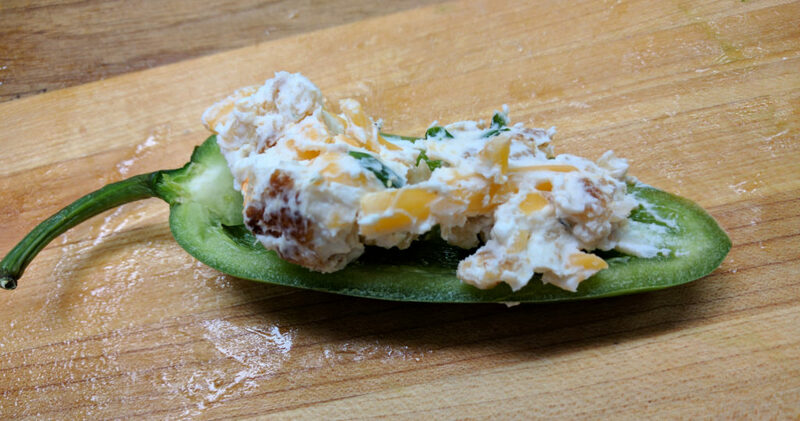 Step Four: Firmly press a teaspoonful of the shrimp mixture into each of the jalapeno peppers. 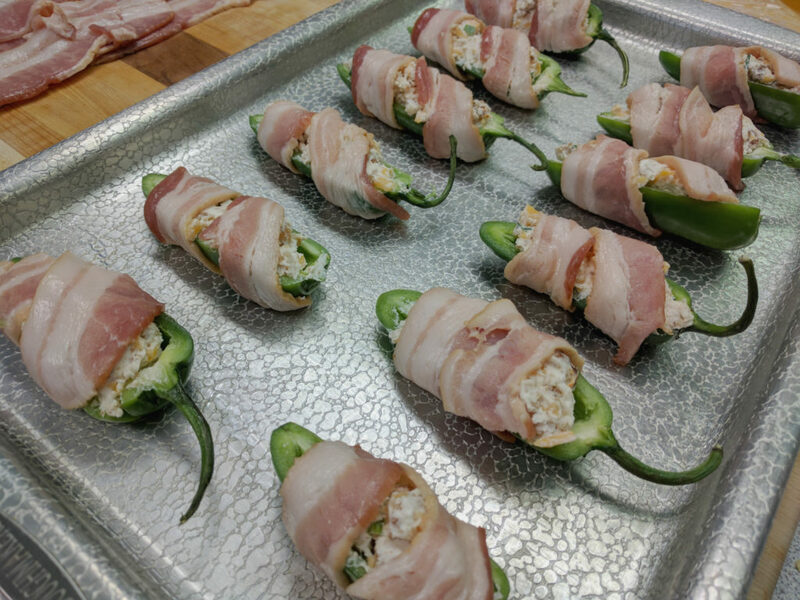 Then, wrap each one with half a slice of bacon. Step Five: Put those babies in the oven to bake for about 20 minutes. That’s just enough time to make a dip, if you have any extra popcorn shrimp. And that’s all there is to it! 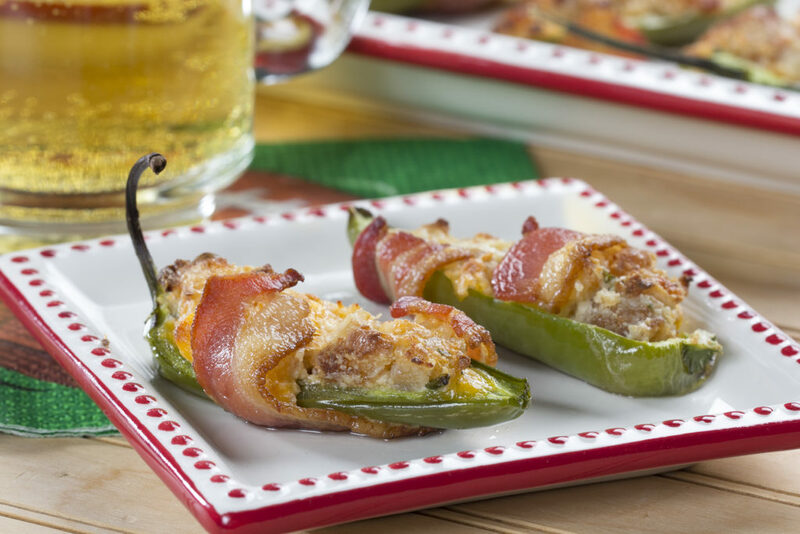 These Bacon-Wrapped Jalapeno Poppers are a nice change from the traditional, breaded and fried jalapeno poppers. I love how creamy-cheesy they are on the inside, along with the little crunch and flavor that the popcorn shrimp adds to them. Oh yeah, and the bacon…I like that too! I’m pretty sure everyone at my house is going to devour these. Are you making anything new for your game day spread this year? Mr. Food, I love your recipes. 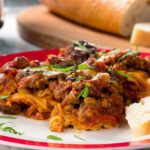 As I start a weight loss program is it possible to add total calories and breakdown to your recipes? Thanks!